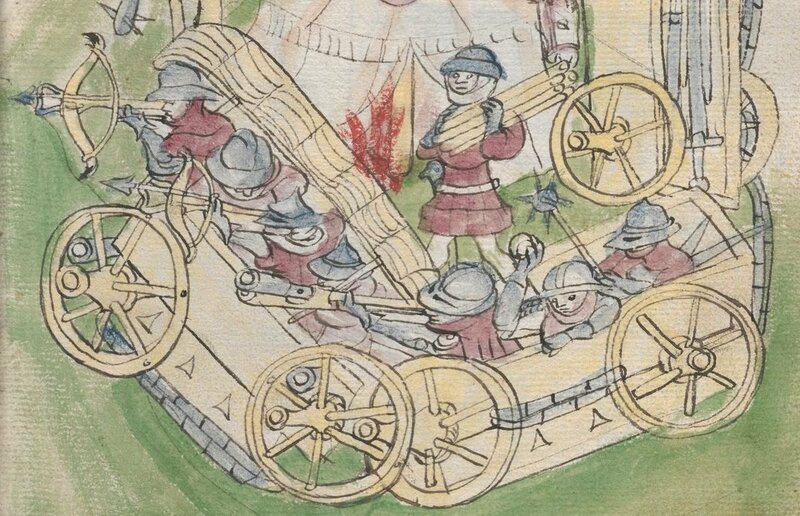 During the course of a century, medieval military commanders from Eastern Europe to India would make use of wagons as their key element in winning on the battlefield. Here is the story of how wagons became a weapon of war. In 1419 the Hussite Wars broke out in Bohemia (modern day Czech Republic) between the followers of the religious reformer, Jan Hus, and the combined forces of several Catholic kingdoms and principalities and the Papacy. The cause of the uprising in Bohemia was the execution of Jan Hus at the Council of Constance in 1415 CE and the subsequent death of King Wenceslaus IV of Bohemia in 1419. Jan Hus’s teachings criticized the Catholic Church, its hierarchy, and doctrines including: those on ecclesiology, the Eucharist, indulgences, and other theological topics. Hus was one of the earliest church reformers and his ideas were to have a big impact on Western Europe and the development of Protestantism. Hus’s teachings were welcomed by the people of Bohemia and Moravia who were angry at the power held by the German speaking minority in these regions; they were also dissatisfied with the dominant position, wealth, and power of the Catholic Church. The Council of Constance of 1414 was convened to deal with the problems that beset the Church: schisms, three popes, and multiple contenders to the throne of the Holy Roman Empire. Hus was invited to attend the council with a promise of safe conduct by King Sigismund of Hungary (who was also the head of the Holy Roman Empire). During the council this protection was retracted because Hus was accused of heresy by the prelates of the Church who convinced Sigismund (who was initially angered by Hus’s arrest) that promises made to a heretic were not binding. On July 6, 1415 Jan Hus was burned at the stake in Constance. During the next four years there was widespread unrest throughout Bohemia. One of the first ways the Bohemians showed their outrage was through the celebration of mass where the congregation received both the consecrated bread and the wine (the clergy being the only ones previously to have partaken in the wine), one of Hus’s reforms. Priests who refused to do this were driven out of their parishes and replaced with those who followed Hus’s teachings. Thus, the chalice became the symbol of the reformed Hussite Church and its followers and adorned the flags and banners of the Hussite armies. The unrest boiled over into open rebellion in 1419 with the First Defenestration of Prague, when Hussite rebels threw the representatives of the king out of the windows of the city hall of Prague. King Wenceslaus IV died shortly after wards. The Hussites also expelled many Germans and Catholics from the towns and cities of Bohemia. These events set the Bohemian and Moravian Hussites on the road to war with some of Europe’s most powerful rulers. Between the years 1419-1436 five unsuccessful crusades were launched against the Hussites. How was this relatively small region of Bohemia able to weather such assaults? How were the Hussites, mostly townspeople and peasants, able to stand up to and defeat the armies mustered by Sigismund, the nobility of the Holy Roman Empire and Hungary, and the Catholic Church? The answer is: the wagenberg tactic. This strategy involved the use of heavy wagons reinforced with protective sides. Groups of such wagons, numbering from a dozen to thousands, could be link together to form formidable field fortifications with a significant amount of firepower that could withstand and defeat the crusaders’ heavy cavalry. War wagons and wagon forts had been used in the past by various peoples for military purposes, but it was the Hussites who used them to such an extent and in such a way that gave them a military superiority over the best heavy cavalry that the Germans, Hungarians, Knightly orders, and the Papal States could field. Armored war wagons, called Dongwu Che, were used in ancient China from the fifth century BCE onward. These armored wagons were initially used to protect soldiers and sappers as they approached enemy walls and fortifications during siege operations. The Han also used them successfully in field battles to protect their soldiers from arrow fire during their campaigns in the northern steppe regions against the Xiong Nu. There are also records of Celtic and Germanic tribes using wagon forts against the Romans. Often the wagons were deployed behind the battle lines to protect the tribe’s women, children and, animals and also served as a strong point to which the warriors could retreat if the battle turned against them. Wagons were used in this manner at the Battle of Vercellae in 101 BCE by Boiorix, chief of the Cimbri; at the Battle of Vosges in 58 BCE by Ariovistus, chief of the Suebi; and at the Battle of Watling Street in 61 CE by Boudica, queen of the Iceni. In these examples the war wagons were not used very effectively and at least in the case of the Battle of Watling Street, they impeded the Iceni retreat, which led to a general massacre. At the Battle of Adrianople in 378, the Goths set up their camp on top of a hill, which was encircled by their wagons. They successfully defended this wagon fort against their Roman enemies until the Gothic cavalry, which had been out foraging, arrived to strike the Romans in the rear. At the Battle of Mohi in 1241, the Hungarians constructed a fortified camp against the Mongols using a ring of wagons. The Hussite use of war wagons and the wagenberg tactic was not new, as the examples above have demonstrated. However, it was the innovations that they introduced to this method of warfare that makes them stand out. The Hussites were one of the earliest groups to effectively deploy gunpowder weapons such as handguns and artillery in field battles (gunpowder weapons had been in use in Europe since the 14th century, but were mainly relegated to siege operations). The Hussites, the majority of whom were townsmen or peasants, were greatly inferior in cavalry compared to their opponents. The Hussites’ first military leader, Jan Zizka (a former captain of King Wenceslaus’s palace guard and later a mercenary), was an excellent soldier and tactician. He recognized that his followers could never withstand the forces mustered against them in a traditional battle due to their inferior numbers, armor, and lack in effective heavy cavalry. Zizka’s solution was to develop the Hussite wagenberg tactic, which allowed his soldiers to withstand the enemy cavalry’s attacks. The Hussites’ wagenberg or wagon fortress was the key to their success on the battlefield. Usually the war wagons were drawn up in a rectangular formation on higher ground (where possible). Enemies attacking the wagenberg advanced against heavy crossbow, handgun, artillery, and sling fire. The few attackers who actually made it to the line of wagons were unhorsed by the defenders using hooks on long poles and killed by the halberdiers and flailmen defending the wagons and the gaps between them along the battle line. When the enemy started to fall back, often in disarray, the Hussite cavalry attacked them from their positions on the flanks of the wagenberg. Initially the Hussite cavalry was relatively small in number, but with time a large enough mounted force was established to effectively guard the flanks of the army both in battle and while moving. On some occasions the Hussites also used their war wagons in an offensive capacity to break through enemy lines using the concentrated firepower of these moving fortresses. The Hussites’ innovative use of the wagenberg in both defensive and offensive operations saw them defeat larger and better equipped crusader armies during the five crusades launched against them. The Battle of Sudomer, fought On March 20 1420, was the second major battle of the Hussite Wars. A small force of 400 Hussites and 12 war wagons led by Jan Zizka was attacked by a column of 2,000 heavily armed and armored crusader/imperialist cavalry. The imperial knights were unable to break through the Hussite defensive position and suffered very heavy casualties in the fight until nightfall when Zizka and his small force (which included women and children) made their escape. Later that year, Zizka once again defeated a superior imperial army personally commanded by King Sigismund at Vitkov Hill, preventing the crusaders from entering Prague and securing the Bohemian capital for the Hussites. In 1421, a Hussite force of 10,000-12,000 Hussites commanded by Zizka intercepted Sigismund’s army of about 50,000 men as they attempted to take the city of Kutna Hora. During the first day of fighting the pro-Catholic groups within the city rose and opened the gates allowing a detachment of the crusader army to enter and a general massacre of the Hussites within ensued. This reverse not only lost the Hussites the city, but also saw Zizka and his troops surrounded. The following morning Zizka launched an all-out attack on the weak points of the imperialist lines and broke free of the surrounding enemy ring using his war wagons with handgunners and mounted cannons as medieval tanks to successfully break free, safely extricating his forces from certain destruction. At the Battle of Aussig in 1426, Zizka and an army of 11,000 men and 500 war wagons defeated an imperial crusading army of 13,000. The Hussites set up their wagenberg on a hill and inflicted heavy casualties on the enemy as they approached. Some of the imperial knights were actually able to break through the wagenberg only to come up against a secondary line of defenses composed of a wall of pavises. The Hussite cavalry then rode around and encircled the knights who were surrounded and butchered. According to the contemporary sources the imperialists lost over 4,000 men (with thousands more of those who fled being hunted down and killed in the surrounding villages after the battle), while the Hussites only suffered light casualties, allegedly as few as 30 men according to some sources, in the fighting. In the later stages of the conflict, the Hussites launched raids and offensive campaigns beyond Bohemia. After 1430 they raided into Hungary, Austria, Germany, and Poland wreaking great devastation and destruction in their path in what they called “beautiful rides.” In fact, so great were their depredations that Joan of Arc sent them a letter warning them that she would attack and destroy them if they did not cease their attacks and recant their “heretical” beliefs. Throughout the Hussite Wars divisions emerged within the ranks of the Hussites. The radical Taborite and Orebite brotherhoods eventually came to blows with the more moderate Ultraquists and their struggle culminated in the Battle of Lipany in 1434, which ended with the victory of the moderates. With the moderates at the helm peace negotiations were initiated and a deal was made to which all parties reluctantly agreed. King Sigismund proclaimed the Hussite wars over in 1436. However, he made plans to destroy the Ultrquists who now controlled Bohemia, but died a year later. His successor’s reign was short and during this time the Hussites were able to establish the Reformed Church of Bohemia and even raised a Hussite king to the throne in 1457. The Hussites survived long enough in Bohemia to impact the Reformation a century later, a feat that they would not have been able to accomplished had it not been for their military innovation in using the wagenberg and gunpowder weapons against the larger better equipped imperial and crusader armies that were sent against them. In the last year of the Hussite Wars King Sigismund had hired John Hunyadi, who would become one of the greatest military commanders of Hungary and one of its most powerful noblemen and political figures, and his band of 50 mercenary lancers. Hunyadi accompanied Sigismund to Prague in 1436 where he added to the military knowledge he had already learned as a condottiere in Italy by studying Hussite military tactics, especially the wagenberg. He created a strong professional army composed of his personal retainers, Hungarian light cavalry, and Hussite and German mercenaries. He recognized the value of using war wagons and gunpowder weapons in the field and employed the tactic very successfully against the Ottomans who were advancing in the Balkans and raiding the southern frontiers of Hungary. Hunyadi’s favorite tactic was to lure the Ottomans into an attack on his wagenberg and to then strike them in the rear with his cavalry. Hunyadi won several victories against the Ottomans between 1441 and 1442, setting the stage for the offensive into Ottoman territory, which is known as the Long Campaign (1442-1444) or the Crusade of Varna. He defeated an Ottoman raid led by Ishak Pasha against Smederevo in 1441, destroyed another Ottoman army led by Mezid Bey’s in Transylvania in the spring of 1442, and defeated an Ottoman punitive expedition led by Shihabeddin Pasha in the autumn of the same year. In his encounter with Shihabeddin’s forces Hunyadi sent his war wagons, manned by crossbowmen and with small caliber cannon mounted on them, to strike the Ottomans in the rear while he attacked them head on, using his wagons in this battle in an offensive capacity. The Ottomans probably encountered war wagons for the first time during these battles with Hunyadi, a tactic that probably surprised them and could partially explain the string of defeats they suffered until their victories a couple of years later at Zlatitsa in 1443 and at Varna in 1444. Hunyadi’s war wagons were even crucial in those battles that he lost. For instance, the defeated crusaders withdrew to a wagenberg manned by Bohemian and German handgunners after their defeat at the Second Battle of Kosovo in 1448. The wagenberg and its 2,000 defenders held off the Ottoman pursuers long enough for Hunydai and the other survivors to make their escape. Hunyadi’s son Mathias Corvinus was elected the king of Hungary in 1458. He created a professional standing army known as the Black army, which was composed of mercenaries. He continued his father’s tradition of using Hussite tactics. A contemporary Venetian witness states that in one battle against the Ottomans he deployed 3,000 war wagons. Another observer claims that at a military review in 1475 or 1479 there were as many as 9,000 war wagons. While another Venetian envoy reported that the basic unit of the Hungarian army consisted of one man-at-arms, six light cavalry, and one wagon. By around 1470, the Ottomans had also adopted the wagenberg, which they called tabur jangi (or cengi). The Ottomans initially fought in the traditional fashion of steppe pastoralists, depending on the mobility and firepower of light cavalry wielding composite bows. However, by the mid fourteenth century the Ottomans adopted a new battlefield formation. This new battle array’s most important aspect was the establishment of a strong defensive battle line to guard the sultan’s position at the center of the army flanked by cavalry. Initially, the defenses were composed of ditches, stakes, entrenchments, and barricades. This defensive line was manned by the infantry, including the elite janissaries. Sometimes, camels were also deployed to the front along the trench lines to frighten the horses of the advancing enemies. The adoption of the wagenberg and its incorporation as a central strategy for the Ottomans can be seen as the final stage in the evolution of this battle array. The incorporation of wagons and guns into Ottoman field tactics was undoubtedly influenced by their encounters with this stratagem fighting the Hungarians. The Ottomans used the wagenberg to win several decisive battles which resulted in securing their frontiers against powerful foes and the expansion of their empire. In 1478 the Ottomans clashed with the powerful Aq Qoyunlu (White Sheep) tribal confederation that controlled Armenia, Azerbaijan, Eastern Turkey, most of Iran, and Iraq from 1378-1501. The Aq Qoyunlu, ruled by Uzun Hasan, had support the Turkic Anatolian beyliks and the Byzantines against the Ottomans. With the defeat and conquest of his allies, Uzun Hasan sought an alliance with Venice. This alliance, rather than deter an attack, prompted the Ottoman sultan, Mehmed II, to invade the territories of the Aq Qoyunlu. The two forces clashed at the Battle of Otlukbeli (also known as the Battle of Bashkent) in 1473. The Ottomans successfully deployed a wagenberg in the battle against the Aq Qoyunlu army, which fought in the traditional nomadic manner. The wall of war wagons held against the Aq Qoyunlu army’s repeated charges and the musketry and artillery concentrated in them wrought havoc among the tribesmen. The battle ended with a decisive Ottoman victory. About 70,000 Ottomans easily defeated a much larger force of about 120,000 Aq Qoyunlu Turkmen tribesmen. The Aq Qoyunlu suffered heavy casualties of up to one third of their army (about 34,000 men) while the Ottomans losses amounted to about 1,000 men. The Ottomans deployed their war wagons in a similar manner against the Safavids at the Battle of Chaldiran in 1514. The Safavids had risen to power in 1500 and replaced the Aq Qoyunlu as the dominant power in Iran and Iraq and as the main rivals of the Ottomans in the east. Shah Ismail, the founder of the Safavid empire, was hitherto undefeated and was confident of a victory. He committed the error of allowing the Ottomans to fully deploy their wagenberg before attacking them. The Safavids, like the Aq Qoyunlu before them, were cut down by the musketry and cannon fire of the janissaries and gunners manning the Ottoman defensive positions. Shah Ismail’s army was shattered at Chaldiran and the only thing that saved the Safavids from an Ottoman conquest was a mutiny among the Janissaries who wanted to return to Istanbul after a long hard campaign. Two years later the Ottomans invaded Syria, which was ruled by the Mamluk sultanate. They first clashed with the Mamluk army at Marj Dabiq, north of Aleppo. The Mamluks had experienced fighting against the Ottomans during the first Ottoman-Mamluk War, 1485-1491. In their previous battles with the Ottomans the Mamluk heavy cavalry, some of the best in the medieval and early modern periods, timed their charges to occur when the Ottoman gunners were reloading their artillery. Therefore, the Battle of Marj Dabiq started off in the Mamluks’ favor. They broke through the Ottoman wagenberg in several places and routed large sections of the Ottoman army, capturing a number of standards, artillery pieces, and war wagons. However, things disintegrated quickly as parts of the Mamluk army fell to looting the Ottoman camp, while the left wing, led by a traitorous mamluk officer, defected to the Ottoman side, and other sections of the Mamluk army did not join the battle due to partisan rivalries between the various Mamluk factions. The disciplined Janissaries and gunners of the Ottoman army regrouped, and those wagons that had not been destroyed or captured were manned and brought to bear on the disorganized Mamluks routing them from the field. The Ottomans also defeated the Hungarians at the Battle of Mohacs in 1526, putting an end to the once mighty Kingdom of Hungary. Gunpowder weapons did play a major role in this battle; however war wagons are not mentioned in the sources. This may be due to the fact that the Hungarians attacked the Ottomans before they could fully deploy for battle. With these victories the Ottomans expanded their empire to include Egypt Syria, Eastern Anatolia, Western Arabia (including Mecca and Medina two of the holiest sites for Muslims), parts of Iraq and Iran, and on the European front they conquered large parts of Hungary pushing all the way to Vienna and secured their hold on the Balkans. The Mamluks were fully conquered by the Ottomans in 1517. However, even they attempted to use the wagenberg tactic in their last ditch effort to push back the advancing Ottomans only months after they had been defeated at Marj Dabiq. In the final clash between the two powers at the Battle of Raydaniyya, just north of Cairo in Egypt, the Mamluks’ hastily assembled army included about 100 wagons carrying arquebusiers and light cannons which were chained together and deployed behind a fortified entrenched position with heavier guns. The Mamluks lost the battle, but the Ottomans suffered heavy losses as they advanced against the Mamluk defensive lines. Who knows, perhaps if the Mamluks had a little more time, they may have been able to create a modern army similar to that of the Ottomans and even survived the Ottoman conquest. The Safavids also learned from their disastrous encounter with the Ottomans and their war wagons at Chaldiran. The new ruler Shah Tahmasp, had reformed the army, which now included artillery and units of men armed with handguns. At the Battle of Jam in 1528, fourteen years after their defeat at Chaldiran, the Safavids deployed a modern army against their rivals in the east, the Uzbeks, a nomadic polity that had risen in Central Asia. The center of the Safavid battle line was composed of a wagenberg. Heavy wagons were chained together and once again manned by gunners and archers. The Uzbeks managed to put the Safavid cavalry on the flanks of the wagenberg to flight, but repeatedly failed to break through the line of wagons and were routed by a Safavid counter attack after suffering heavy losses. The Timurid Empire fell apart shortly after its founder’s death due to fragmentation and the rise of new powers such as the Aq Qoyunlu, the Safavids, and the Uzbeks. After failing to retake and hold Samarqand, the old capital of the Timurid Empire, Babur, one of the last Timurids, headed to Afghanistan and took Kabul as his base of operations. It was not long before he was marching into Northern India. He had been invited by Daulat Khan Lodi, the governor of Lahore, to join a rebellion against his master Ibrahim Lodi, the ruler of the Lodi Kingdom, which controlled much of Northern India. On April 21, 1526 Babur’s army, about 12,000 strong, defeated the much larger Lodi army of 50,000 men and 1,000 war elephants. One of Babur’s advisors was Ustad Ali Quli, an Ottoman expert, who arranged his army in the standard Ottoman formation with a wagenberg at the center of his battle line manned by infantry armed with handguns and field artillery pieces. The result was once again a resounding victory thanks to the war wagons and the firepower that was concentrated in them. The Lodi army lost over 20,000 men, while Babur’s casualties were comparatively light. This battle was the first step in the establishment of the Mughal Empire that would control most of the Indian subcontinent until its decline in the 18th century. In less than 100 years, the wagenberg tactic made its way from Bohemia all the way to India. Jan Zizka’s innovative use of wagons and gunpowder weapons in the field gave his lightly armed and armored soldiers, for the most part peasants and townsmen, a fighting chance against the knights of the crusading armies sent against them. However, this tactic was so effective that Hungarian nobles and kings, Ottoman sultans, Mamluks, Safavid Shahs, and Timurid empire builders all recognized the value of deploying war wagons and concentrating firepower in them to repel numerically superior forces fighting in more traditional ways. These powers used the wagenberg effectively throughout the 15th and 16th centuries. But as field artillery developed and became more powerful and accurate, the wagenberg became obsolete. However, one cannot discount the effect that this innovative military tactic had on warfare and the development and use of gunpowder weapons on the battlefields of the late medieval period. Adam Ali is a lecturer at the University of Toronto. Click here to read more from his articles.